Breaking off of long-held animosities between the two nations, US President Barack Obama plans to make a visit to rival nation Cuba, ABC News reported. The trip, scheduled for 21 March, is part of a larger tour of Latin America by Obama. It is understood that the trip is an attempt by Obama to bury old hatchets and improve diplomatic ties between the United States and Cuba. US almost entered into a nuclear war with Cuba in 1962. 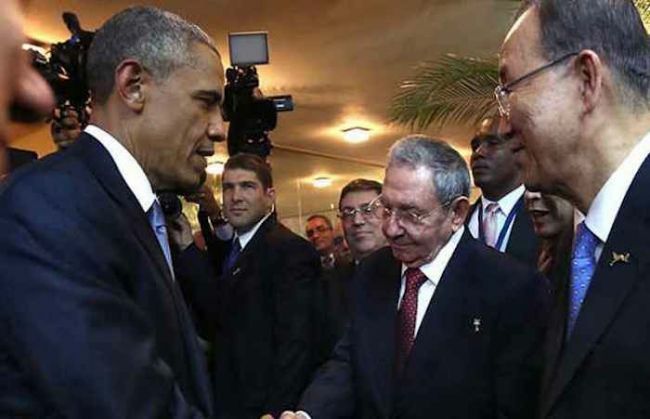 Obama has pledged to restore diplomatic channels with Cuban leader Raul Castro, in a series of talks that have amounted to the lifting of sanctions, reopening of embassies, prisoner exchange, as well as the humanitarian release of US contractor Alan Gross in December 2014. Obama has come under fire from 2016 presidential hopefuls from the Republican party for his efforts to improve ties with Cuba. Marco Rubio and Ted Cruz, both of Cuban descent, have strongly criticised the move to extend ties with a nation that hasn't seen political change in decades. This trip is the first such initiative undertaken by a sitting US President in 87 years. Calvin Coolidge was the last US president to visit Cuba in 1928. Can football fuel a war between Russia and Turkey?